Back to the Boleyn yesterday for the first game of the season. I didn’t get off to a good start though as an accident (not me!) on the M11 meant that I got to the ground a few minutes after kick-off. It also meant I missed the lifetime achievement award to Billy Bonds before the match, which was frustrating, as I wanted to play my little part in paying tribute to the great man. The term “legend” is bandied about too freely these days, but in sporting terms, then Bonzo certainly would be worthy of that title. You could never, ever accuse him of showing a lack of effort throughout a club record 793 appearances. He was the epitome of “leading by example”. Hard but fair, his tough-tackling reputation often detracted from the fact that he was also a skillful footballer – not in the class of a Brooking or Devonshire for sure, but he had a good touch and could play a pass. You don’t play that many games mostly in the top division, filling roles as right-back, centre-half and midfielder without having more than a bit about you. 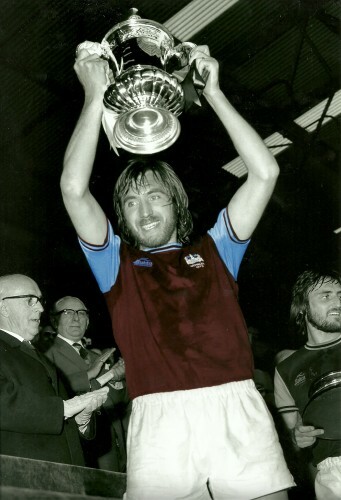 Billy Bonds LIfts the FA Cup in 1975. He repeated the feat in 1980. Anyway, back to the present bunch. It was a good solid start to the season yesterday, with an ultimately comfortable win over new-boys Cardiff. Well-taken goals by Cole and Nolan in each half saw us gain a 2-0 win to get us up and running. There were decent performances all over the pitch from our players, with Cole the outstanding one for me. But Stewart Downing’s substitute appearance in for the last 20 minutes nearly stole the show, as he looked threatening every time he got the ball. In truth, Cardiff had little to offer, and I can’t recall a single on target effort from them. Jussi finger-tipped one effort, but I’m pretty sure that was going over anyway. Even Bellamy looked off the pace and was substituted. On this showing, they are in for a long and difficult season. While this win was comfortable, we’ll have to step up our game against the better sides to get results. However, I’m looking forward to seeing Carroll’s return and the supply of crosses he’ll get from Downing, as this could be a potent partnership for us. And if Downing is not on form, then there’s Jarvis and Cole to provide the ammunition. With Morrison having had a good pre-season and now on the fringes of the first team, our attacking midfield options are looking strong. However, our strike force is looking thin. Without Carroll, we only have Maiga as a viable alternative and while he did a job yesterday, he is not suited to the lone-striker role. We desperately need to strengthen in this department. The board say we need to sell first – if so, then we need to say goodbye to Vaz Te, Taylor, Diarra and Collison. It would be a shame to move Collison out as he is one of our youth products, but his options are looking limited at the club now – he didn’t even make the bench yesterday. Finally, it was great to catch up with old friends yesterday.